Using our Google Analytics integration, you can easily collect live chat related data and log it in on your Google Analytics account. Give it a go to learn more about your visitors browsing habits and make use of all the valuable data gathered. This integration doesn’t collect any personal data of the visitor. Google Analytics integration is enabled for all trial accounts – if you have just signed up for a free trial, feel free to skip this step! Go to the Google Analytics integration page and click on the Install application button. You will get a notification that the app was installed successfully. From now on, the aforementioned information will be tracked in your Google Analytics as events. Make sure you have both the LiveChat tracking code and Google Analytics tracking code installed on your sites in order to log all the information coming from LiveChat to your Google Analytics account. If you plan to use the Google Tag Manager integration, you need to configure a couple of additional settings to make sure that various events are recorded correctly. Learn how to integrate your Google Tag Manager with LiveChat to properly record on-site events. 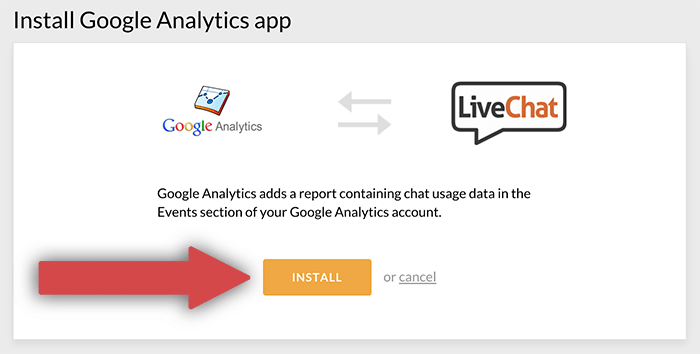 If you are using several different versions of the Google Analytics code, you can let LiveChat know which version to use for the integration. Depending on which instance of the code you want to track, you can use the following values for the parameter: "pageTracker | urchinTracker | gtm | gaq | ga". After selecting the values to track, place the additional piece of code in your LiveChat tracking code. Feel free to copy the example above and use it on your website – just remember to replace the XXXXXXX with your own license number! Both your code and your license number can be found at Settings > Installation > Chat widget section of your LiveChat.